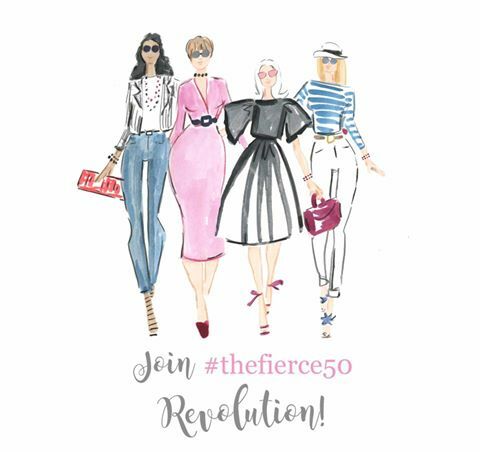 This week the Lifestyle Sistas and I are sharing the 5 favorite pictures we've taken. Once again, this was SO hard. How to choose only five? I finally had to narrow it down to pictures that are currently on my desktop, and even then it was difficult. 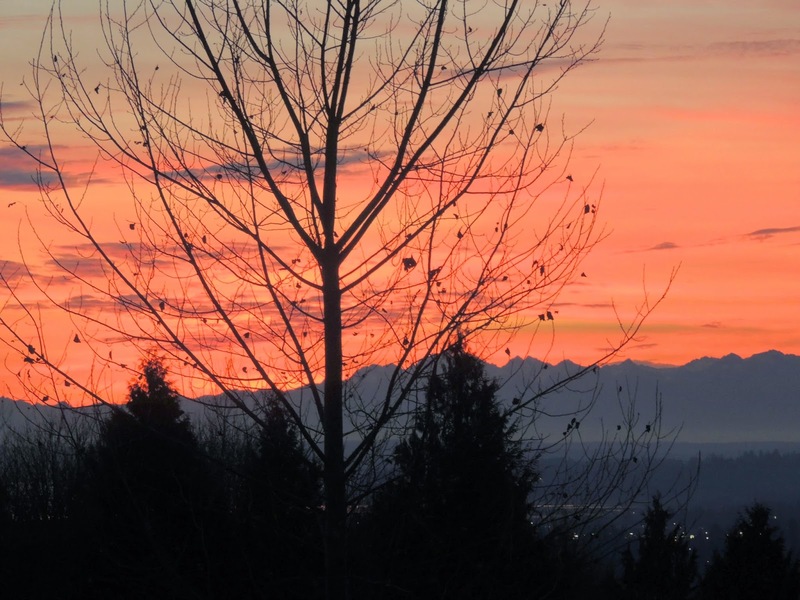 The first picture above was taken from our deck last winter, looking out at Puget Sound and the Olympic Mountains. There are some spectacular sunsets around here, especially on cold, clear days. My hubby says it's because of all the air pollution - way to spoil a perfectly beautiful sunset :)! 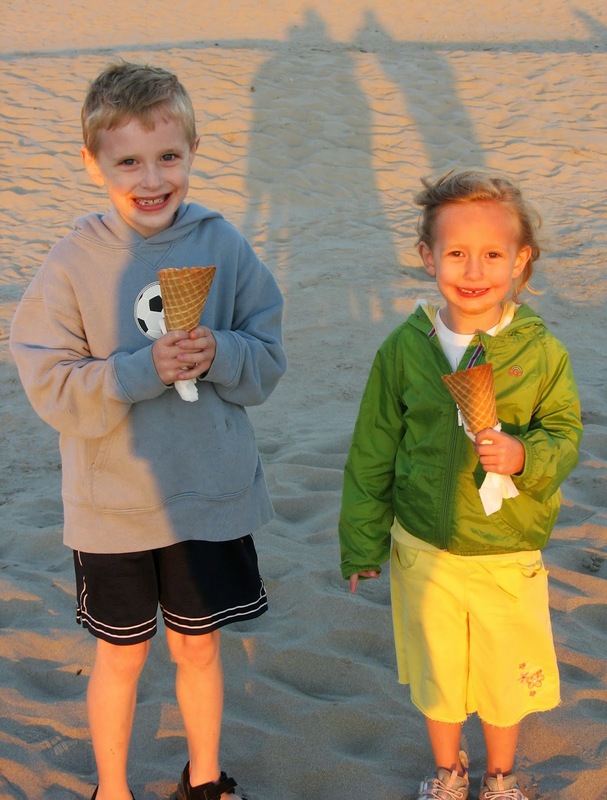 I took this of my niece and nephew at the beach. The shadows you see above them are five adults all trying to get them to smile for the picture - not an easy task with this pair! Love those cute little faces! This is our dog Abby on the day we brought her home seven years ago. She went missing (oops, bad new puppy owners), and I found her in the garage, snuggled up in C's hockey bag. If you've ever smelled hockey gear....let's just say, I hope you haven't had the "pleasure". Apparently Abby found it comforting. This is T playing in the ocean at Manzanita. 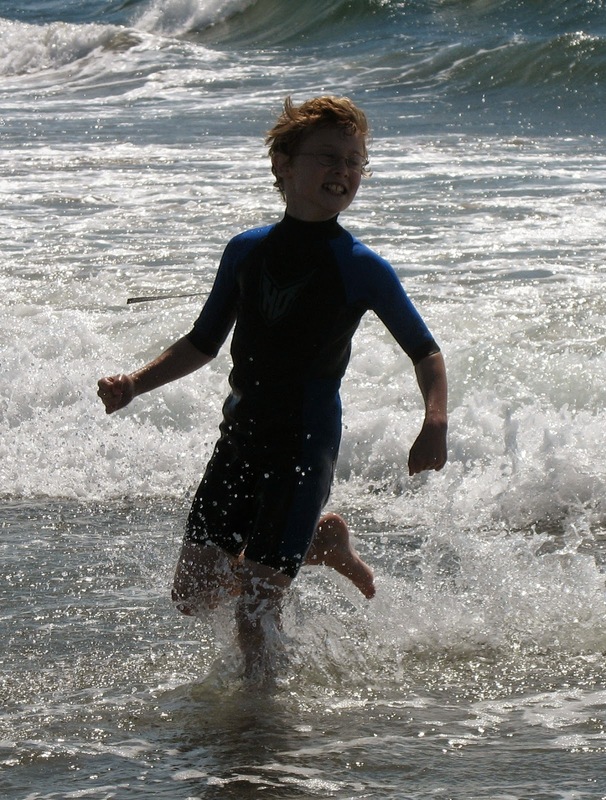 I think it captures the joy of the experience of running in and out of the waves - for hours. I love everything about this picture. We were SO proud of C on his graduation day, and he was pretty proud of himself too. As soon as we found him after the ceremony, my hubby gave him a huge bear hug. I cry every time I look at it. 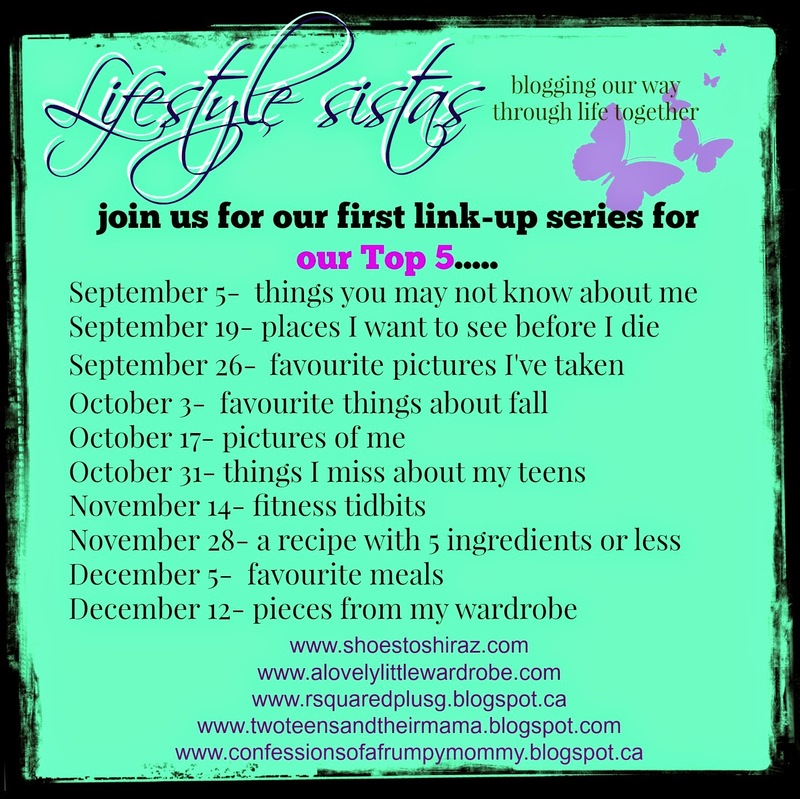 Hope you'll link up below, or join us next Friday for 5 things I love about Fall. Check out my other Lifestyle Systas! Love the memories associated with great pictures. These are all special ones! It was fun looking through pictures, trying to choose five. It does bring back so many memories. What a great way to look back at favorite memories! That picture of the sunset is beautiful! Have a great weekend! Thanks Jill. Hope you have a great weekend too! I love the photo of your son hugging his dad. I feel like you can feel the love and emotion in this picture. Great shot! It's one of my very favorite pictures ever. I wish the focus was a little sharper - I had a new camera at the time and was still learning how to use it. Isn't it amazing how just a few photos can give a pretty accurate view of someone's life? I loved this insight into yours. Thanks Carol. Pictures are a great way to learn about someone. Beautiful pictures, my friend. They tell so much about you. Thank you Deena. When are we going to NYC together :)? Hopefully you will put yourself in that photo Lana. Thank you - we get a lot of beautiful sunsets, but the ones in winter seem to be the most vibrant. It does look kind of spooky/halloweenish though! 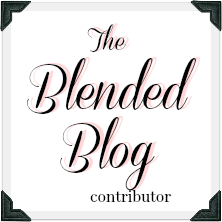 Thank you - I'm so glad I found your blog - it's wonderful. What I love about these pictures is that they all evoke such different emotions. I adore that sunset picture, what a gorgeous view. Love them, Lana! I especially enjoyed the meaning behind each of them. You are always so genuine and heartfelt. Have a lovely weekend, friend! And you are always such a kind friend! Hope your weekend is great as well. omg that puppy pic just killed me!!!!!!!!!!!!!!! so cute!! love the pics of the boys too! so proud! Aren't puppies the cutest? I kind of want another one, but it's so much work! These are all awesome pics, but holy cow, that sunset is STUNNING! Rena, you are so sweet, as always! Wonderful photos Lana! Thanks for sharing them. 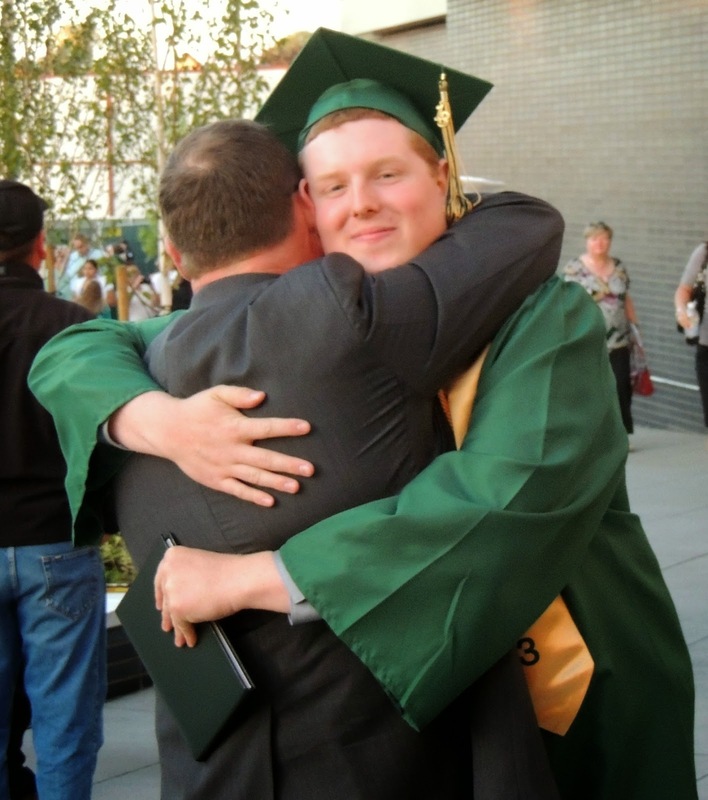 The one of C. nearly made me cry - the combination of the hug from your husband, and the way your son is looking directly at you with such pride is truly a wonderful family moment caught in an image! I will be linking up with my post tomorrow! Thank you Susan. Can't wait to see your pictures! That view!! Can I please come visit?? As for the shadows one, I think it has a cool effect and composition. Obviously shadows directly on the kids' faces is not ideal but it's so cool! Absolutely - anytime!!!! Thank you for the photography compliment - it means a lot coming from you! Great pictures and memories! I love the one in the waves. You really captured the moment well and his happy expression is so cute. My boys could play in the waves for hours. But it's so cold on the Oregon coast - which is why he's wearing a wetsuit!